"Little did we know when picking an attorney on a random basis, that we would be so satisfied. We usually go with professionals on a recommendation, but could not in this case. We were very pleased with the way you answered questions and the turnaround time in getting back to us." When asked what was the most important aspect of the service they received, the couple had this to say "Hands down, this would be the thorough explainations of all the forms Rob had to sign at the closing. 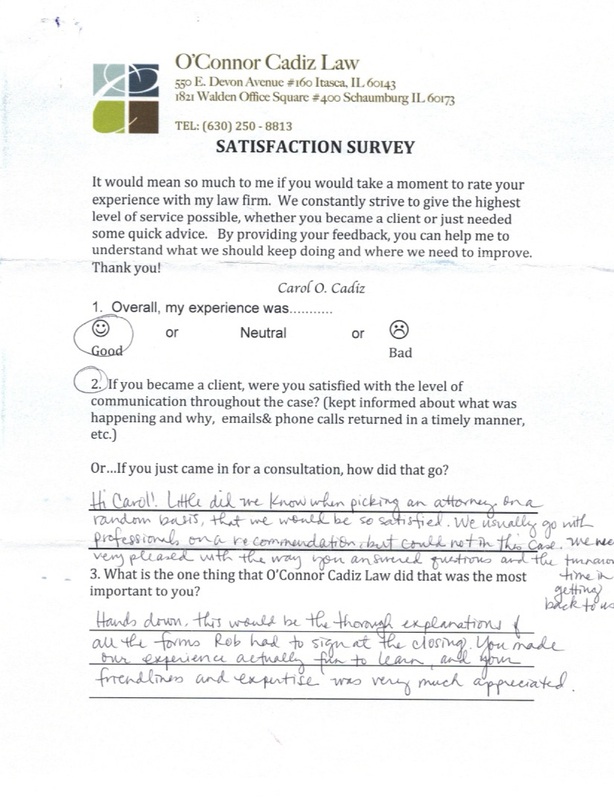 You made our experience actually fun to learn, and your friendliness and expertise was very much appreciated." What about the lawyer's approachability? "Carol is really approachable and made us feel valued and cared for with the level of communication and helping us understand what was what. She made herself available to us for answering questions both during the process and beyond the closing, which meant a lot. We feel we can be comfortable calling her in the months to come....We felt that you were really with us and not just hired help." Click on image below to view the actual testimonial.